Close-Up view of the Zenhaven cover. Zenhaven was born out of the success of our innerspring mattress, Saatva, and our memory foam mattress, Loom & Leaf. The Saatva Company is a place where we discovered people like ourselves — people who didn’t think it was too much to ask to get the best night’s sleep on a luxury mattress without the cost, drama, and hassle of mattress shopping in stores. Natural latex is the best-kept secret in sleep. But for those lucky enough to have experienced it, nothing else will do. It instantly responds to every curve of your body for pressure-free support and incomparable comfort. Its durability is outstanding, and it naturally resists mold and microbes. No latex delivers this feeling more luxuriously than the American Talalay latex we use in Zenhaven. We’ve topped our latex layers with an ultra-comfortable layer of 100% organic New Zealand wool — all wrapped inside a lush organic cotton cover. And because the Talalay process produces a very consistent latex in a wide range of firmness levels, we’ve been able to build two different comfort levels into a single mattress — simply flip the mattress over to choose the other comfort level. Zenhaven is the perfect marriage of luxurious comfort and healthy support. 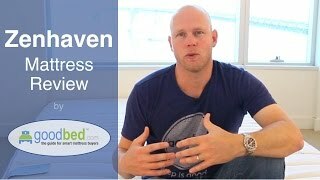 To decide whether Zenhaven is the right choice for you, read GoodBed's expert review of the Zenhaven mattress or watch our in-depth video review of the Zenhaven mattress. Is Zenhaven the right bed for you? Mattress fit is personal. This mattress type is an ideal match for 13% of people. Are you part of that 13%? Based on 174 real owner experiences with this brand. How do people like you rate their Zenhaven mattress? Mattresses are personal. Filter the 174 Zenhaven ratings by sleep position, weight, age, gender and more to find the ones that are most relevant for you. Zenhaven mattresses are recommended by 79% of owners on GoodBed (based on 174 ratings + 72 reviews). Want more reviews from Zenhaven mattress owners? Do you have something to say about your Zenhaven mattress? Write a Review! Note: The product line specifications above were derived from the active Zenhaven models listed on GoodBed. As a result, these details may not be comprehensive and may not apply to all Zenhaven models. If you are seeking specifications for a particular Zenhaven mattress, please search for that mattress by name on GoodBed, or check with your local Zenhaven dealer. Sleep the way nature intended. Zenhaven is a mattress manufacturer founded in 2016 that is based in Westport, CT in the United States. Zenhaven is a Saatva company, as is Loom & Leaf. Have an update or correction to our information about Zenhaven? If so, please take a moment to suggest an edit. Zenhaven mattresses sold by Zenhaven come with a 120-night in-home trial. Your mattress can be returned for any reason during the 120 night in-home sleep trial. Only the Lineal adjustable base cannot be returned or exchanged. For returns, Zenhaven will pick up your mattress and provide a full refund minus a $99 handling fee. Zenhaven mattresses are only available online.